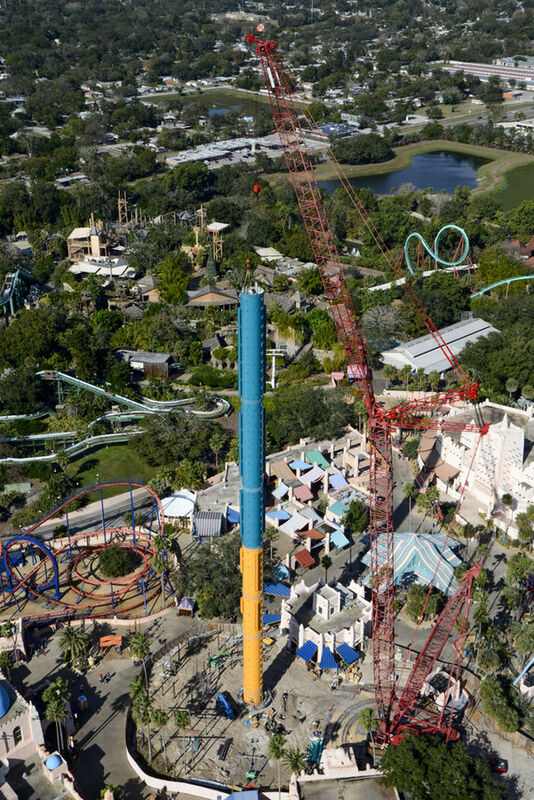 Progress at Busch Gardens Tampa for their new Drop Tower attraction, Falcons Fury has reached a big milestone this week. The tower finally topped over 300 feet tall, leaving just the last section to be completed, the tower cone. Which will top the ride off at a rather staggering 335 feet tall. This will allow riders to drop a staggering 315 while facing the ground. Yes, facing the group. The ride carriage or 'gondola' for Falcons Fury will rotate riders to 90 degrees, facing the ground before they proceed to drop you on what I can imagine will feel like your face! This ride is the first time ever this feature has been used on a drop tower. With this new addition and new technology, I've heard some fans rumbling and wondering if Falcons Fury will face the same issues that Mach Tower at Busch Gardens Williamsburg has had issue with. The ride is slated to open in Spring of 2014. No word yet on if the rides gondola has arrived at Busch Gardens Tampa. Well, let's wait and see while hoping for the smoothest opening possible! Personally I'm not a fan of drop tower style rides but with the unique (and likely scary as hell) view Falcon's Fury will give, I may have ride it.. once.